ABZ manufactures a series of high performance butterfly valves ranging from 2-48 inches with 150-600 psi. Their valve design is ideal for manual or automated actuation and is used for industrial, chemical, HVAC, and food and beverage applications. 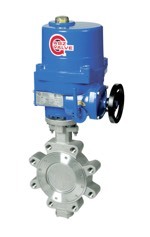 An ABZ high performance butterfly valve can be installed with a manual hand gear, electric actuator, or a pneumatic actuator to fit any of your projects or design specifications.